Tupperware has been a pioneer in microwave cooking for decades, but this innovation is truly a game changer. With the SmartSteamer, fresh, light, deliciously steamed meals start cooking at the push of a button. You’re bound to start seeing your microwave a little differently and eating better without sacrificing flavor. Colander tray keeps delicate foods further from steam and is deep enough for filets. Steamer base features aluminium lining that blocks microwaves from touching foods. ACCESSORIES Slow cooking sauce insert with sloped lip for easy pouring. Water tray is translucent so you can see water boiling. Ramekins for cooking, serving and storing individual portions of desserts and more. What’s cool about it? Truly steams food, as microwaves only boil the water for steaming & can’t penetrate the Base or Colander. Steaming is a well-known fat-free cooking method. It also retains nutrients, fatty acids, minerals & vitamins. Steaming makes colors more vibrant & helps food retain moisture, natural texture & flavor. Colander Tray keeps delicate foods farther away from steam. Food drains through the Colander as it steams. 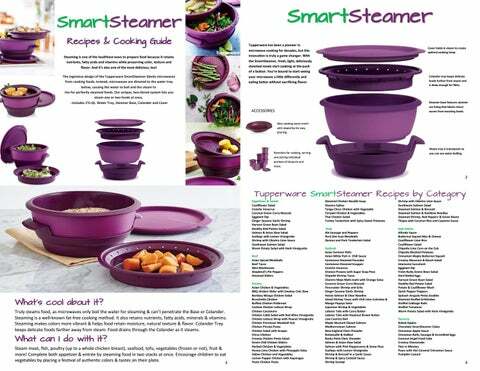 Tupperware SmartSteamer Recipes 6. 7. 8. 9. 10. 11. 12. 13. 14. 15. 16. 17. 18. 19. 20. 21. 22. 23. 24. 25. 26. 27. 28. 29. 30. 31. 32. 33. 34. 35. 36. 37. 38. 39. 40. 41. 42. 43. 44. 45. 46. 47. 48. 49. 50. 51. 52. 53. 54. 55. 56. 57. 58. 59. 60. 61. 62. 63. 64. 65. 66. 67. 68. 69. 70. 71. 72. 73. 74. 75. 76. 77. 78. 79. 80. 81. 82. 83. 84. 85. 86. 87. 88. 89. 90. 91. 92. 93. 94. 95. 1. Pour beer into a snack cup and place in the base of the Smartsteamer. Place sausage links around snack cup. 2. Place peppers, and onion in the SmartSteamer colander 3. Fill steamer water tray with 1¾ cups water. Place steamer base over water tray and place colander over base. Cover and microwave on high power 8 minutes. 4. In a medium saucepan combine chicken stock, mustard, cornstarch and salt, simmer on low heat, add vegetables. 5. Place sausage on hoagie roll, top with sauce and peppers. 1. Pour heavy cream into SmartSteamer Tray. 2. Fill steamer water tray with 1¾ cups water. Place steamer base over water tray and place tray over base. Cover and microwave on high power 6 minutes. 3. In a small bowl, whisk together cornstarch and water. 4. Add cornstarch mixture, shredded Parmesan, salt and pepper to hot cream. Return to microwave and microwave for another 6 minutes. 5. Remove from microwave and whisk sauce until smooth. Serve warm. Place cooked rice in a small bowl. In a medium Thatsa Bowl, mix the remaining ingredients and shape into 12 meatballs. Roll meatball in the rice, Place 6 balls in Colander and 6 balls in Steamer Base . In Fill Water Tray of Smart Steamer with water to fill line. Place Steamer Base over the Water Tray. Cover and steam in the microwave on high power 10–15 minutes, or until the meatball is cooked through. 1. Place shrimp in Tupperware SmartSteamer colander tray and sprinkle with ¼ tsp. salt. 2. Fill water tray to minimum fill line. Place colander tray over steamer base and place steamer base over water tray. Cover and microwave on high power 3 minutes. Remove from microwave; set aside. 3. Meanwhile, toss together carrot, kale, cabbage, onion, sesame oil, vinegar, ginger and remaining salt in a medium bowl. Set aside. 4. Add warm water to a second medium bowl. Dip 1 rice paper wrapper in water to moisten and transfer to clean cutting board. 5. When pliable, place three shrimp in a single row in the center of the rice paper. Place about 1–2 tbsp. cabbage mixture on top of shrimp. Top with 3–4 cilantro leaves. 6. Fold the right and left sides of the wrapper inward. Starting from the end closest to you, roll into a tight cigar shape; set aside. Repeat with remaining wrappers. 7. Serve cold or at room temperature. Cut the fish filets into serving portions and season them with salt and black pepper. Place fish in the bottom casserole tray of the SmartSteamer. Place casserole tray on top of water tray. Cover and microwave on high power for 8-12 minutes. Until fish is flaky or opaque. Transfer the fish to a nice serving plate. In a saucepan bring the water, chili powder, cilantro, soy sauce, sesame oil, ginger, garlic, red pepper flakes, and sugar to a boil, for two minutes. 6. Check the seasoning and adjust if necessary. 7. Arrange the fish and bok choy on serving plates and pour the chili sauce over the top. 1. Core each apple making a large well in the center and arrange in the base of the SmartSteamer. 2. In a small Thatsa Bowl, mix oats, brown sugar, flour and cinnamon together in a bowl; cut in butter until evenly combined. Spoon approximately ¼ cup of the oat mixture into each apple. 3. In Fill Water Tray of Smart Steamer with water to fill line. Place Steamer Base over the Water Tray. 4. Cover and steam in the microwave on high power 10–15 minutes. 1. Rinse chicken under cold running water, remove giblets from cavity and discard. Pat dry with a paper towel. 2. Place chicken in the Steamer Base breast side down to achieve even cooking. Fill the Water Tray with 1¾ cups water. Place Steamer Base on Water Tray, cover and microwave on high power for 28-30 minutes or until the internal temperature of the breast reaches 165° F/75° C. 3. Allow chicken to cool, covered in the Steamer Base. 4. Mix mayonnaise, vinegar, sugar, celery seed, onion powder, salt, pepper and liquid smoke in a large bowl. Add coleslaw mix and stir to combine. 5. Once chicken is cool enough to handle, remove chicken from Steamer Base, remove and discard skin and remove meat from the bone, discarding bones. Shred meat using fingers or two forks and place in saucepan over medium heat. Add barbecue sauce and seasoning blend. Bring to a simmer and stir to combine. 6. Spoon chicken onto slider buns. Top with coleslaw if desired. 1. In a medium Thatsa Bowl, mix the ground beef and taco seasoning. 2. Loosely add beef in Steamer Base. (don’t pack down) 3. In Fill Water Tray of Smart Steamer with water to fill line. Place Steamer Base over the Water Tray. 4. Cover and steam in the microwave on high power 10 minutes, or until the meat is cooked through. Let stand for 5 minutes, stir and serve. 5. Heat taco shells according to package. 6. Prepare tacos to your preference. 1. Sprinkle ¼ tsp. salt over chicken breast. Place chicken in base of SmartSteamer. Place 1¾ cups water in the water tray, place steamer base over water tray, cover and microwave on high power 8–10 minutes or until juices run clear and internal temperature reaches 165°F/75°C. 2. Place the yogurt, mayonnaise, curry powder, lime juice and honey. in the base of Power Chef fitted with the Whip Accessory and turn handle until well mixed. 3. Add the remaining ingredients and gently combine with the dressing. 4. Serve immediately or refrigerate for up to three days. 1. Flatten chicken cutlets using a mallet or pan and season one side with salt and seasoning. 2. Place garlic, basil and tomatoes in base of Chop ’N Prep Chef, cover and pull cord until finely chopped. 3. Spread tomato mixture over unseasoned side of chicken cutlets, roll each cutlet and secure with toothpicks. 4. Place chicken in base of SmartSteamer. Fill Water Tray to minimum fill line with 1¾ cups water, place base over Water Tray, cover and microwave on high power 10–12 minutes or until chicken is cooked through and reaches an internal temperature of 165° F/75° C. 5. Top cutlets with mozzarella and replace cover of SmartSteamer 1–2 minutes to melt the cheese. Serve warm. 1. Preheat oven to 350° F/175° C. 2. Cut butternut squash into large 2″ pieces. Place into base of SmartSteamer, pour 1¾ cup water into water tray, stack and cover. Microwave on high for 20 minutes. 3. Place pasta into Microwave Pasta Maker and add 6 cups water and salt. Microwave on high for 10–12 minutes or until pasta is al dente. 4. In two batches, add steamed butternut squash to Power Chef fitted with blade attachment. Cover and pull cord until processed. Remove to medium bowl. 5. Stir cheese, milk and butter into warm squash. Stir in pasta once it is cooked. Spread in to UltraPro Casserole Pan and top with breadcrumbs. 6. Bake at 350° F/175° C for 15 minutes to brown breadcrumbs. 1. Add water to the SmartSteamer water tray. 2. Season both sides of the flounder with salt and pepper. Place flounder in the bottom casserole tray of the SmartSteamer. Place casserole tray on top of water tray. 3. Cover and microwave on high power for 8-12 minutes. Until fish is flaky or opaque. 4. Transfer the fish to a nice serving plate. Spread the cilantro and about one third of the scallion (use the green portions), directly onto the steamed fish. 5. Combine the soy sauce, salt, sugar and water into a small bowl and mix well. 6. Heat a small chef series saucepan to medium to high heat and add 2 tbsp. of canola oil. Add the ginger and let it brown lightly, about a minute. Then add the rest of the scallions. 7. Next, add your soy mixture to the saucepan and keep the heat on high to keep everything sizzling. Cook until the scallions are wilted – about 30 seconds. Take it off the heat and spoon the entire mixture over the fish. 1. In a small bowl, stir together green onion, ginger, salt and pepper. 2. In the water tray of the Tupperware SmartSteamer, add water to the max fill line. Place steamer base inside water tray; place colander on top of steamer base. 3. Place two fish fillets in colander. Divide green onion mixture evenly between the two fillets, spread across top of each fillet. Cover and microwave on high power 9 minutes. Remove from microwave, remove cover and transfer fish to a serving dish. 4. Make the sauce. In the 2-cup Micro Pitcher, stir together shallot, ginger, garlic, orange juice, maple syrup, salt, vinegar, and cornstarch. Microwave on high power 1 minute 30 seconds. Remove from microwave, stir sauce and pour over fish. Serve warm. 1. Place chicken in SmartSteamer base. Place colander tray on top and cover. Fill water tray with 1¾ cups water. Place steamer base over water tray, cover and microwave on high power 10 minutes or until no longer pink. Chop the chicken breasts into small chunks. Set aside. 2. In frying pan, heat the sesame oil over medium heat. 3. In the meantime, chop the onion, ginger and garlic in a Quick Chef Pro. Add the mixture to the pan and cook 5 minutes, until vegetables are tender. 4. Add the chicken, cashews, hoisin sauce, soy sauce and chili sauce. 5. Stir and cook until heated through. 6. Serve immediately with lettuce, allowing everyone to assemble the lettuce wraps themselves. 1. Cut cauliflower florets off of stem. 2. Assemble Grate Master Shredder with coarse grater cone and place medium bowl underneath. 3. Place cauliflower florets 1–2 at a time into hopper. Press down gently with plunger and turn crank to grate cauliflower. Repeat with remaining cauliflower until all is grated. 4. Fill water tray of SmartSteamer with 1¾-cup water. Place steamer base over top of water tray and place SmartSteamer Tray over base. 5. Add grated cauliflower to SmartSteamer Tray, cover, and microwave on high for 8 minutes. 6. Toss steamed cauliflower with remaining ingredients. Serve warm. 1. Place half bag of cauliflower in SmartSteamer Colander Tray and remaining half bag in Steamer Base. 2. Fill Water Tray with 1¾ cups water. Place Colander Tray over Steamer Base and place Steamer Base over Water Tray. 3. Cover and microwave on high power 10–12 minutes, or until cauliflower is al dente. 4. Meanwhile, combine remaining ingredients in medium bowl and stir until combined. Set aside. 5. Remove SmartSteamer from microwave, combine all cauliflower in Steamer Base, and run under cold water until it has cooled, about 30–60 seconds. 6. Pour cauliflower into Quick Chef Pro base, fitted with the blade attachment, cover and turn handle just a few times to very roughly chop. 7. Transfer cauliflower to empty bowl and replace blade with basket attachment. Place half cauliflower into basket, cover and turn handle to remove excess water from cauliflower, about 15 seconds. Repeat with remaining cauliflower. 8. Add cauliflower to ingredients in medium bowl and mix well. 1. Toss shrimp with half citrus juices and place in SmartSteamer. Fill Water Tray with 1¾ cups water. Microwave on high for 7 minutes. 2. Remove from microwave, place shrimp in the Quick Chef, fitted with blade attachment, and chop coarsely. Transfer to a large bowl. Add remaining citrus juices to the bowl. Set aside. 3. Place cucumber, onion and pepper in base of the Quick Chef and chop coarsely. Transfer to the bowl with shrimp. 4. Place the tomato, avocado and cilantro in base of the Quick Chef and turn handle to chop coarsely. Add to the bowl. Stir to combine ingredients, season to taste. Serve with tortilla chips if desired. 1. Place diced chicken in the Steamer Base, taking care not to block all the holes. Place vegetables and garlic in the Colander Tray. 2. Fill the Water Tray with 1¾ cups chicken broth. 3. Place Steamer Base and Colander Tray over the Water Tray. Cover and microwave on high power for 8 minutes. 4. Meanwhile, in a 2 cup micro Pitcher, stir together tomato paste, crushed tomato, chicken stock, corn starch, oregano, and salt. Cover with the 1 cup micro pitcher and microwave on high 2 minutes. 5. Place pasta on a serving dish and top with chicken and vegetables, pour sauce over chicken. 1. Season chicken breasts with salt and pepper and place in SmartSteamer. Fill Water Tray with 1¾ cups water. Microwave on high for 15 minutes or until no longer pink. 2. Remove from microwave, chop chicken into chunks. 3. In the Quick Shake container, mix all ingredients for the Red wine vinaigrette, shake to mix. 4. Combine the romaine and watercress and place onto a large serving platter. 5. Arrange the eggs, tomatoes, chicken, avocados, bacon and blue cheese in strips on top of the greens. 6. Drizzle with some of the vinaigrette dressing. Serve immediately. Place remaining dressing at the table. 1. Cook the spaghetti according to pasta maker directions. Drain the pasta and return it to the pasta maker; then toss with ½ cup parsley and the lemon zest and juice. 2. Season chicken with salt and pepper. Place chicken in the Steamer Base, taking care not to block all the holes. 3. Fill the Water Tray with 1¾ cups chicken broth. Place Steamer Base and Colander Tray over the Water Tray. 4. Cover and microwave on high power for 12-14 minutes or until no longer pink. 5. In a small sauce pan add remaining ingredients and cook for 1-2 minutes. 6. Place pasta in a pasta dish, cover with chicken and pour sauce over chicken, top with remaining parsley. 1. Place chicken breasts in base of Smart Steamer. Fill water tray to minimum fill line. Place base on tray, cover and microwave on high for 18-22 minutes. Allow to rest, covered for 5 minutes. 2. Remove chicken and cut into cubes. 3. Place chicken breast, mayonnaise, sour cream and seasoning blend in base of Quick Chef Pro System. Replace cover and turn handle until finely chopped or until desired consistency is achieved. 4. Do not over process. Remove blade, place in medium bowl and fold in pecans and grapes. 1. Combine prawns, soy, lime zest and juice, chili, garlic, ginger and 2 tablespoons water in a bowl. Allow to marinate for 10 minutes. 2. Place snap peas in base of Smart Steamer. 3. Place prawns in the colander tray, and stack on top of base. 4. Fill water tray to minimum fill line. Place base on tray, cover and microwave on high for 6-8 minutes. Allow to rest, covered for 5 minutes. 5. Toss prawns in a bowl with sugar snaps, spring onion and coriander. Divide among plates. 6. Heat the oils in a small pan over medium heat for 1-2 minutes until smoking. Drizzle over prawns, scatter with sesame seeds and serve with rice. 1. Place corn on the cob in base of Smart Steamer. Fill water tray to minimum fill line. Place base on tray, cover and microwave on high for 6 minutes. 2. Place butter, lime juice, chipotle with sauce, salt and seasoning blend in base of Power Chef System with whip attachment. Mix until smooth. 1. Place cubed sweet potatoes in the Colander Tray. Fill Water Tray with 1¾ cups water. Place Steamer Base on top of Water Tray and Colander Tray over Steamer Base. Cover and microwave on high power for 14 minutes or until sweet potatoes are tender. 2. Put potatoes in a medium Thatsa bowl, add butter, chipotle peppers and sauce, and mash. 1. Cut shrimp into bite-sized pieces and sprinkle with adobo seasoning. Set aside. 2. In a medium bowl, combine olive oil, lime juice, garlic, cilantro, green onions, sugar, salt, and seasoning blend and stir. Set Cilantro Vinaigrette aside. 3. Slice jicama thinly and place in the base of the Quick Chef Pro System. Cover and turn handle to process. 4. Add broccoli slaw, replace cover and process again. 5. Combine slaw and Cilantro Vinaigrette and stir. 6. In a small bowl, mix sour cream and chipotle pepper until well combined. 7. Place shrimp in the Steamer Base and fill the Water Tray with 1¾ cups water. 8. Place Steamer Base on top of Water Tray. Cover and microwave on high power for 4 minutes. 9. Let rest, covered, 2 minutes. Serve shrimp, slaw and chipotle sour cream on warmed corn tortillas. 1. In a Thatsa Bowl, combine orange segments, red pepper, scallion, red onion, jalapeno, and cilantro Add 1 tablespoon of lemon juice salt and pepper to taste, mix well and set aside. 2. In a Season-Serve Container, season fish with lime juice, seasoned salt and freshly ground pepper. 3. Place broccoli in SmartSteamer colander tray and seasoned fish in SmartSteamer base. Pour 1 ¾ cups of water in water tray. Place the steamer base on the water tray and the colander on the steamer base. Cover, place in the microwave and heat on high for 10 to 12 minutes or until fish flakes easily and is opaque. 4. Place fish and broccoli on a serving plate and top with Orange Salsa. 1. Mix cake mix, according to box directions. 2. Spray snack cups with spray oil, and fill about half way with cake mix. 3. Place snack cups in SmartSteamer base. Fill water tray with 1¾ cups water. Place steamer base over water tray, cover and microwave on high power 10-12 minutes or until no toothpick comes out clean. 4. Frost if desired. Place apples into base of SmartSteamer. Pour 1¾ cup water into water tray. Place Steamer Base on top of Water Tray. Cover and microwave on high power for 20 minutes. Remove apples from Smartsteamer and place into the Power Chef base, and add brown sugar, cinnamon and vanilla, pull cord until desired consistency is reached. 1. Cut butternut squash into large 1″ pieces. Place into base of SmartSteamer, pour 1¾ cup water into water tray, stack and cover. 2. Mix remaining ingredients, pour in sauce tray. 3. Microwave on high for 20 minutes. 4. Place squash on a serving plate and pour sauce over squash. 1. Place cinnamon Grands in SmartSteamer base, place sausage links in between the rolls. 2. Fill water tray with 1¾ cups water. Place steamer base over water tray, cover and microwave on high power 7 minutes. 3. Insert sauce tray, whisk eggs and pour into sauce tray. 4. Microwave on high power 5 minutes. 1. Place chicken breast in Season-Serve Container. 2. In a small bowl, mix all marinade ingredients, pour ½ over the chicken, reserve the other half for later. 3. Place chicken in base of Tupperware SmartSteamer; sprinkle with white pepper, salt and top with lemons and green onions. 4. Fill water tray with 1¾ cups water. Place steamer base over water tray, cover and microwave on high power 15 minutes. 5. Place chicken on serving dish, pour remaining marinade over chicken. 1. Place garlic, ginger and jalapeño in base of Chop ’N Prep Chef. Cover and pull cord 4–5 times to process until finely chopped. 2. Add mixture to the Water Tray, along with the curry paste, lime zest and juice and coconut milk. Place the mussels in the Steamer Base, place over Water Tray, cover and microwave on high power for 6 minutes. 3. Divide the mussels, placing into individual bowls, stir the sauce in the Water Tray and pour ¼ cup over the mussels in each bowl. Garnish with sliced green onions. 1. Sprinkle ¼ tsp. salt over chicken breast. Place chicken in base of SmartSteamer. Place 1¾ cups water in the water tray, place steamer base over water tray, cover and microwave on high power 8–10 minutes or until juices run clear and internal temperature reaches 165°F/75°C. Lightly shred with fork. 2. Combine pesto, mayonnaise and onion in a medium bowl. Add the chicken and toss to coat. 3. In the Quick Shake container add oil, vinegar, salt and pepper, shake to mix. 4. Add greens and tomatoes to a medium bowl, add vinaigrette and toss to coat. Divide the green salad among 4 plates and top with the chicken salad. 1. Place Chicken in Steamer Base of SmartSteamer and the vegetable in the colander tray. Microwave on high for 10 minutes. Remove colander and rinse vegetables under cold water to stop cooking. 2. Bring 2 Qt. salted water to a boil in a 3-Qt. pot. Add pasta and cook 9 minutes or until al dente. 3. Drain pasta and rinse with cold water until completely cool. 4. Place red pepper in base of Chop ’N Prep Chef. Replace cover and pull cord 2–3 times to coarsely chop. 5. Place pasta, chicken, vegetables and red pepper in a large bowl. 6. Toss with dressing, salt and pepper to taste. 1. Place all ingredients in base of the Power Chef with the whip attachment. Replace cover, turn handle and mix until well combined. 2. Pour evenly into Snack Cups and place in the base of the SmartSteamer. 3. Fill water tray to minimum fill line. 4. Microwave at 50 percent power for 20 minutes or until the custard is set and a knife inserted into the center comes out clean. 5. Chill in the refrigerator at least an hour or until thoroughly chilled. 6. Run a knife around edge and unmold to a serving plate. 7. Serve with fresh berries. 1. Place edamame and corn in steamer base and place zucchini in SmartSteamer colander tray. Fill water tray with 1¾ cup water. Place steamer base on top of Water Tray and the colander tray over steamer base. Cover and microwave on high power for 8 minutes. 2. Meanwhile, fill a large bowl with ice and water. When cook time is complete, remove colander tray and lower it into the ice water, submerging the zucchini for 1 minute. Repeat with steamer base containing corn and edamame. 3. Drain well, and combine the vegetables in a medium bowl. 4. Add garlic, lime juice, seasoning blend, mustard, olive oil, salt and pepper to base of Chop ’N Prep Chef, replace cover and pull cord to process until combined. Add dressing to the vegetables in the bowl and mix well. 1. Place eggplant in steamer base. Fill water tray with 1¾ cup water. Place steamer base on top of Water Tray. Cover and microwave on high power for 25 minutes. 2. Place eggplant in the base of the Power Chef, pull cord until smooth. 3. Add the remaining ingredients, pull cord a few more times to mix well. 1. In a small bowl, combine brown sugar, lime juice, Sriracha sauce and olive oil. Mix until sugar dissolves. Add shrimp and stir to coat. Cover and marinate in the refrigerator at least 30 minutes. 2. Place onions and garlic in base of Chop N Prep. Cover and pull cord 4-5 times to process until finely chopped. Place mixture in the Sauce Insert, cover and place over base of the SmartSteamer. 3. Fill water tray to minimum fill line. Place Steamer Base over Water Tray. Cover and microwave on high power for 5 minutes. 4. Add the water, grits and salt to Sauce Insert and stir to combine. Microwave an additional 10 minutes, stopping the microwave to stir halfway through the cook time. Remove steamer from microwave and stir cheese into grits. 5. Remove shrimp from marinade. Place shrimp in Steamer Base. Microwave an additional 2½ minutes or until shrimp are pink and opaque. 6. Place ¼ cup grits in a bowl with three shrimp. 1. Place first five ingredients in base of Power Chef fitted with the Whip Accessory and pull cord 4–5 times to blend to a smooth. 2. Place 1¾ cup water in Water Tray of SmartSteamer. 3. Pour mixture evenly into four snack cups and Place snack cups in base of SmartSteamer. 4. Microwave at 50 percent power for 16 minutes or until custard is set and a knife inserted into the center comes out clean. 5. Chill in refrigerator for several hours. To serve, run a knife around the edges to loosen and invert onto plates. 6. Top with a prepared caramel sauce if desired. 1. Place green beans in SmartSteamer colander tray. 2. Place colander tray on top and cover. Fill water tray with 1¾ cups water. Place steamer base over water tray, cover and microwave on high power 10 minutes. 3. Add remaining ingredients in Quick Shake Container, shake to mix. 4. Put green beans in a medium Thatsa bowl, pour sauce over green beans, sprinkle with walnuts and stir to mix. 1. Place sauce ingredients in base of Quick Shake container, place lid on and shake contents, pour ⅔ over shrimp and marinate for 20 minutes, reserving the rest for a dipping sauce. 2. Remove shrimp from marinade, place shrimp in the Steamer Base and top with half the green onions. 3. Fill the Water Tray with 1¾ cups water. Place Steamer Base on top of Water Tray. Cover and microwave on high power for 4 minutes. 4. Let rest, covered, 2 minutes. 5. Sprinkle remaining green onions over shrimp and pour a dash of sauce over if desired, and sprinkle with toasted sesame seeds. 1. Using food guider, slice fennel using Mandoline round knob set to #2, triangular knob to “lock” and select the straight v-shaped blade insert. Place slices in SmartSteamer colander tray. 2. Place green beans in SmartSteamer base. Place colander tray on top and cover. Fill water tray with 1¾ cups water. Place steamer base over water tray, cover and microwave on high power 10 minutes. 3. Mix lemon juice, mustard, ⅓ cup olive oil, salt and pepper in Quick Shake Container. 4. Add green beans, fennel, pecan and cranberries into large bowl with dressing and stir to combine. 5. Serve immediately. 1. Place potatoes in the Smart Steamer Base, fill water tray to max fill line with 1¾ cup water and microwave on high power 17–18 minutes, until potatoes are fork-tender. 2. While potatoes cook, in Chef Series 3-Qt. Saucepan over high heat, bring water to a boil, add eggs and cook about 7–9 minutes. 3. Once eggs are cooked, remove from water and allow to cool. Peel eggs. Cut eggs using Slice ’N Wedge with wedge insert. Place in a medium bowl. 4. After SmartSteamer base has cooled, lift from water try and run cold water over potatoes to cool. Cut potatoes using Slice ’N Wedge with wedge insert and add to bowl. 5. Add green onions, dill, Greek yogurt, Dijon mustard, salt and pepper to bowl and stir well to combine. 1. Place first eight ingredients in base of Chop ’N Prep Chef. Replace cover, twist to seal and pull cord 4–5 times to chop and combine ingredients. Remove blade and transfer sauce to a small bowl. 2. Place chicken broth in Water Tray of SmartSteamer. Place chicken in Steamer Base; season with salt and pepper and brush with sauce. 3. Place green beans and red pepper strips in Colander. Place the Steamer Base on top of the Water Tray and the Colander on top of the Steamer Base. 4. Cover and microwave on high power 14 minutes or until chicken reaches an internal temperature of 165˚F/75˚5. Transfer chicken to a serving platter and brush with sauce. Toss vegetables with remaining sauce and serve. 1. In a large bowl, whisk together juice of 3 limes, olive oil, ¼ cup cilantro and honey and season with salt. Add chicken the Season Serve Container, pour the marinade over the chicken. Let marinate in the refrigerator at least 3 hours, or up to overnight. 2. In the base of the Power Chef Pro add pineapple, red onion, remaining lime juice, remaining tablespoon cilantro and pepper, place cover on and pull the cord a few times to chop, add avocado and stir to mix. 3. Place the marinated chicken in the Colander and place the Colander over the Steamer Base. 4. Cover and steam in the microwave on high power 10–15 minutes, or until the chicken is cooked through and juices run clear. 5. Place chicken on a plate and top with salsa. 1. Slaw, In a medium size mixing bowl, combine the mayonnaise, lime juice, chili powder and salt. Stir to combine. Add in the shredded coleslaw and stir to combine. Refrigerate in an airtight container until needed. 2. Salsa, In the base of the Power Chef Pro add salsa ingredients, place cover on and pull the cord a few times to chop. 3. Shrimp, In a small bowl mix rub ingredients together. 4. Pat the shrimp dry. Rub spice mixture over both sides of shrimp. Let sit in the refrigerator for about 15 minutes. 5. Place the shrimp in the Colander and place the Colander over the Steamer Base. 6. Cover and steam in the microwave on high power 6 minutes, or until the shrimp is cooked through. 7. Assemble the tacos by layering the chili lime coleslaw, shrimp, and topping with mango papaya salsa. Best served warm. 1. Place chicken and Italian dressing in the Season Serve Container and refrigerate for 1 hour. 2. Fill water tray to minimum fill line. Place the vegetables in base of SmartSteamer and marinated chicken in the top colander. 3. Place in microwave for 15 minutes, stir the vegetables and cook an additional 10 minutes. 4. Put chicken and vegetables into a serving dish, sprinkle with the dry Italian seasoning, stir to mix. 1. Season chicken with lemon pepper seasoning, salt and thyme. Place chicken in the base of the SmartSteamer, top with sliced lemons. Place on top of Water Tray. 2. Add asparagus to Colander sprinkle with fresh cracked black pepper, garlic, lemon zest and juice. (Some juice will go through to the chicken) place colander on top of Steamer Base. 3. Steam in microwave on high power for 20 minutes or until chicken is cooked through and no longer pink. 1. Toss potatoes, corn and onion in ¾ tsp. seasoning and place in base of SmartSteamer. 2. Fill water tray with 1¾ cups water. Place steamer base over water tray, cover and microwave on high power 10 minutes. 3. Place sausage and shrimp in colander tray of SmartSteamer and season with remaining seasoning. 4. Remove SmartSteamer from microwave and remove cover. Stack colander tray with shrimp and sausage over steamer base and cover. Microwave on high power 5 minutes or until shrimp are cooked through and potatoes are tender. 1. Sprinkle half the salt and pepper over the salmon filets and place them in the Steamer Base. 2. Place carrots in the Colander Tray and place the snow peas on top of the carrots. 3. Fill Water Tray with 1¾ cups water. Place Steamer Base on top of Water Tray and Colander Tray over Steamer Base. Cover and microwave on high power for 8 minutes or until salmon is opaque in the center and reaches a temperature of 145°F/63°C. 4. Meanwhile, in a small bowl, combine the maple syrup, mustard and thyme. Set aside. When cooking is complete, drizzle olive oil over vegetables, sprinkle remaining salt and pepper over them and stir to combine. Drizzle salmon with maple-mustard glaze and serve with vegetables. 1. Sprinkle salt and pepper over the salmon filets and place them in the Steamer Base. 2. In a small bowl, add vegetables rosemary, garlic and salt, toss to coat. Place vegetables in the Colander Tray. 3. Fill Water Tray with 1¾ cups water. Place Steamer Base on top of Water Tray and Colander Tray over Steamer Base. Cover and microwave on high power for 8 minutes or until salmon is opaque in the center and reaches a temperature of 145°F/63°C. 4. Meanwhile, place tapenade ingredients in the base of the Power Chef, place cover on and pull cord a few times to chop. 5. Place Salmon on serving dish and pour tapenade over salmon add vegetable on the side. 1. In a medium Thatsa Bowl, mix the ground beef, onion, garlic, eggs, catsup, crackers, salt, pepper and Worcestershire sauce and shape into mini loaves. 2. Place ½ the loaves in Colander and ½ in Steamer Base. 3. In Fill Water Tray of Smart Steamer with water to fill line. Place Steamer Base over the Water Tray. 4. Cover and steam in the microwave on high power 10–15 minutes, or until the meatloaf is cooked through. 5. In a small bowl, mix catsup and chili powder and spoon over meatloaves. 1. Peel and core the pears, leaving the stems in tact, sprinkle pears with 1 tsp. cinnamon. 2. Place pears in base of SmartSteamer. 3. Fill Water Tray with 1¾ cups water. Place Steamer Base on top of Water Tray. Cover and microwave on high power for 15-20 minutes. Place on serving dish. 4. Meanwhile, mix sugar and flour in a small pot. Stir in the boiling water. 5. Cook gently, stirring constantly until slightly thickened. 6. Add butter and simmer for another 8 minutes. 7. Remove from heat and whisk in the cinnamon and vanilla. 8. Pour hot caramel sauce over pears. In a medium Thatsa Bowl, mix all the ingredients and shape into 12 meatballs. Place 6 balls in Colander and 6 balls in Steamer Base . In Fill Water Tray of Smart Steamer with water to fill line. Place Steamer Base over the Water Tray. Cover and steam in the microwave on high power 10–15 minutes, or until the meatball is cooked through. 5. In a small bowl, combine dipping sauce ingredients. 1. In Chop ’N Prep place artichoke hearts, garlic, Parmesan cheese, basil, olive oil and lemon juice. Pull string until well chopped. 2. Cut chicken breasts into strips about 1 inch and toss them in a bowl with the pesto, put them on the bottom colander, add asparagus to the top colander, with little olive oil and salt & pepper. Cook for 12 minutes! 3. Cook angel hair pasta in a pot on stove, drain, put in big bowl and add the oil left over in the marinated artichoke heart jar, toss, and, then add all the chicken and vegetables from SmartSteamer. 1. Cut potatoes into large chunks, approximately 2″. 2. Cut ½ head of cauliflower into florets. 3. Place potatoes and cauliflower into base of SmartSteamer. Pour 1¾ cup water into water tray and place base on top. Cover and microwave for 25 minutes. 4. After microwaving carefully, place half of potato cauliflower mixture into Power Chef fitted with blade attachment. Cover and pull cord until mashed. Remove to medium bowl and repeat with remaining potato cauliflower mixture. 5. Add milk, butter and salt to potato mixture and stir to incorporate. 1. Fill water tray to minimum fill line. 2. Place all ingredients in base of the Power Chef with whip accessory. Replace cover, turn handle and mix until well combined. 3. Pour into 6 cup Stuffable bowl and place in the SmartSteamer base. Microwave at 100% power for 30 minutes or until the custard is set and a knife inserted into the center comes out clean. 4. Chill in the refrigerator at least an hour or until thoroughly chilled. 5. Run a knife around edge and unmold to a serving plate. 6. Top with whipping cream and Gingersnap cookie. 1. Place water in water tray of Smart Steamer. Place pork tenderloin in steamer base. Cover and microwave on high power 17 minutes, or until the pork tenderloin reaches an internal temperature of 165˚F/74˚C. Let rest 5 minutes, then slice thinly. 2. Prepare quinoa in the Microwave Rice Maker according to the directions in the product insert (1 cup quinoa, 2 cups water. Microwave on high power for 5 min and let stand 15 minutes). Allow to cool and fluff with a serving spoon. Add artichoke hearts, olives, spinach, cherry tomatoes and parsley. 3. In a small bowl, whisk together balsamic vinegar, olive oil and garlic until well blended; season with salt and pepper to taste and pour over salad. Stir to combine. 1. Place all ingredients except the fish, basil leaves and olive oil in the base of SmartSteamer, stir. 2. Season fish with salt and pepper and place in colander tray of SmartSteamer. 3. Fill water tray with 1¾ cups water. Place steamer base over water tray, cover and microwave on high power 20 minutes or until the fish is opaque throughout . 4. Remove SmartSteamer from microwave and remove cover. 5. Transfer the fish to a platter, then stir the basil into the vegetables. Spoon the vegetables around the fish, drizzle everything with the olive oil . 1. Fill Water Tray with 1¾ cups water. Place clams in Steamer Base and potatoes in Colander Tray. Place Steamer Base over Water Tray and Colander Tray over Steamer Base. Cover and microwave on high power for 12-14 minutes or until clams open and potatoes are tender when pierced with a fork. 2. While clams steam, place onion in base of Chop ’N Prep Chef. Cover and pull cord 4-5 times to process until finely chopped. 3. Place bacon in Chef Series 3-Qt. Saucepan over medium heat. Once bacon begins to sizzle, add onions and sauté 5 minutes or until onions are translucent. 4. Remove clams from Steamer Base, remove clams from shells over Water Tray to catch any clam juice and coarsely chop clam meat. Discard any unopened clams. 5. Strain steaming liquid from Water Tray through a strainer lined with a coffee filter or cheesecloth and into a medium bowl. 6. Add liquid from Water Tray plus 2 cups water to saucepan and increase heat to medium high. Add tomato soup, potatoes, chopped tomatoes and black pepper. Slowly bring to a boil, reduce heat and 81 simmer 10 minutes. 1. Place all sweet and sour dressing ingredients in Quick Shake Container. Replace seal and shake until well combined. Set aside. 2. Steam salmon for 10 minutes in SmartSteamer until opaque. 3. Thinly chop cabbage and slice green onions and place in a large bowl. 4. Heat butter in a fry pan over medium heat. 5. Crush noodles and add with almonds to melted butter. Cook until golden brown. 6. Drain well and set aside. 7. Just before serving, add noodles and almonds to cabbage and toss with dressing. 8. Top with steamed salmon. 1. Combine sauce ingredients in a small bowl and whisk in sesame oil with a tiny whisk or a fork. Set aside. 2. Pour water in Water Tray in Smart Steamer and place Base on top of the Water Tray. 3. Brush salmon with olive oil and season with salt and pepper, place in the base of the SmarSteamer, top with ginger, garlic and pink peppercorns. 4. Place snow peas in Colander and place Colander on top of Steamer Base. Season snow peas with salt, pepper and pink peppercorns. Cover, place in microwave and heat on high for 9 minutes or until salmon flakes easily with a fork, is opaque and reaches an internal temperature of 145°F/65° C. 5. Remove from microwave and let stank 5 minutes before serving. 6. Lay out a bed of snow peas on dinner plates, top with fish and drizzle sauce over the top. 1. Place scallops in the Colander Tray and sprinkle with half the salt and pepper. 2. Place asparagus in the Steamer Base. Fill the Water Tray with 1¾ cups water. Place Colander Tray on top of Steamer Base, Steamer Base on top of Water Tray and cover. Microwave on high power for 8 minutes. 3. Meanwhile, in a small bowl, whisk the remaining ingredients together. Serve scallops and asparagus drizzled with dressing. 4. Serve with white or brown rice. 1. Place diced potatoes and carrots in the Colander, potatoes on one side, carrots on the other. 2. Place ground beef, corn, peas, celery, onion, garlic tomato paste Worcestershire sauce and cornstarch in the Steamer Base. Stir to mix. 3. Fill the Water Tray with 1¾ cups water. Place Colander Tray on top of Steamer Base, Steamer Base on top of Water Tray and cover. Microwave on high power for 18 minutes. Open 4. Open Smartsteamer, spoon carrot into meat mixture, add beef broth, stir well. 5. Pour potatoes into a bowl add milk and butter and mash. 6. Spoon meat mixture into the pepper shells, top with mashed potatoes and place in the base of the Smart Steamer. Sprinkle with cheddar cheese. Replace cover and microwave for 5 minutes. 1. Place the shrimp in SmartSteamer Colander Tray and the broccoli in Steamer Base. 2. Fill Water Tray with 1¾ cups water. Place Colander Tray over Steamer Base and place Steamer Base over Water Tray. 3. Cover and microwave on high power 12 minutes or until shrimp are pink and opaque. 4. Heat peanut oil in a Chef Series skillet on medium-high heat. Cook garlic in hot oil until fragrant, about 1 minute. Reduce heat to low; add chicken broth, soy sauce, oyster sauce, and ginger root to the garlic. Bring the mixture to a boil. 5. Toss steamed broccoli and water chestnuts with the sauce mixture, stir to coat with the sauce. Stir cornstarch into the mixture 1 tablespoon at a time until the sauce thickens, about 3 minutes, add shrimp. 1. In a large bowl, toss together shrimp and salt. Transfer shrimp to base of the SmartSteamer. Fill water tray to minimum fill line. Place steamer base over water tray. Cover and microwave on high power 3 minutes. Remove from microwave, stir to redistribute shrimp. Microwave on high power an additional 3 minutes. Remove from microwave; set aside. 2. In the base of the Power Chef System fitted with the blade attachment, combine garlic, tomato juice, tomatoes, horseradish, lime juice, Worcestershire, celery salt and hot sauce. Cover and pull cord until mixture is the consistency of thick tomato sauce. 3. Serve shrimp warm or cold with cocktail sauce. 1. In a snack cup combine butter, garlic vermouth, cornstarch, lemon zest and juice, and parsley, place snack cup in the base or the SmartSteamer. 2. Season shrimp with salt and pepper, place in the SmartSteamer colander. 3. Fill the Water Tray with 1¾ cups water. Place Colander Tray on top of Steamer Base, Steamer Base on top of Water Tray and cover. 4. Microwave on high power for 7 minutes. 5. Place shrimp on serving dish and pour scampi sauce over shrimp. 1. Place half the shrimp in SmartSteamer Colander Tray and remaining half in Steamer Base. 2. Fill Water Tray with 1¾ cups water. Place Colander Tray over Steamer Base and place Steamer Base over Water Tray. 3. Cover and microwave on high power 12 minutes or until shrimp are pink and opaque. 4. Place cilantro and garlic in base of Chop ’N Prep Chef, cover and pull cord several times to finely chop. 5. Mix together all ingredients in 1-Qt. Micro Pitcher. 6. Cover and microwave on high power 1 minute. Sauce will thicken slightly as it cools. Use as a dipping sauce. 1. Using the julienne attachment for the Mandoline, run the zucchini across the blade to create long noodlelike strands. 2. Mince garlic and sunflower seeds using the Quick Chef Pro System. Add spinach, arugula, lemon zest, lemon juice and Parmesan. Chop until finely minced while streaming in olive oil. Add coarse kosher salt and pepper to taste. 3. Place water and salt in the base of the SmartSteamer. Place zucchini strands in SmartSteamer base and microwave on high for 2 minutes. Remove from microwave. 4. In a large bowl, toss together pesto and vegetable noodles until well coated. 5. Serve warm or cold. Place salmon in the Steamer Base, taking care not to block all the holes. Place broccoli in the Colander Tray. Fill the Water Tray with 1¾ cups water. Place Steamer Base and Colander Tray over the Water Tray. Cover and microwave on high power for 8-12 minutes. Until salmon is flaky or opaque. In a small bowl, mix together mayonnaise and ¼ tsp. Southwest Chipotle seasoning. Fill water tray to minimum fill line. Mix hamburger with ¼ tsp. Southwest Chipotle seasoning, salt and pepper and form into one patty. Place patty into the SmartSteamer base. Sprinkle onions onto patty. Microwave for 7 - 8 minutes. Slice rolls in half horizontally, place rolls into top tray. Remove burgers from microwave, place rolls into in SmartSteamer. Let stand for 3 minutes. 8. Cut burger into 9 squares tic tac toe style, spread Chipotle seasoning and mayo on rolls. Place burger onto rolls and eat. Add cheese and condiments if desired. 1. Combine shrimp, ginger, cayenne pepper, garlic, sesame seeds, and pepper in a bowl. Cover and refrigerate 30 minutes. 2. In a small bowl, combine cornstarch, chicken broth, teriyaki sauce, and salt. 3. Fill water tray to minimum fill line. Place Steamer base over water tray. 4. Place Shrimp in Steamer base. Place green beans and red pepper strips in Colander Tray. 5. Microwave on High for 8 minutes or until shrimp are no longer pink. Let stand 15 minutes. 6. In a small saucepan add teriyaki sauce, chicken broth and salt, stir until thickened, add green onions. 7. Place shrimp in a serving dish, top with vegetables, then pour sauce over the vegetables. 1. Fill water tray to minimum fill line and add salt to the SmartSteamer water tray. 2. Remove the two bottom rows of leaves from each artichoke half. Scoop choke from the center of artichokes, rub cut edges with lemon. Place artichokes in SmartSteamer casserole tray, cut side up. Stack casserole tray above water tray; place cover on SmartSteamer. Microwave on high power 5 minutes. Remove from microwave, set aside. 3. In a medium bowl, mix together bread cubes, olive oil, olives, garlic, and ⅛ tsp. coarse kosher salt. Press bread cubes together until moist; divide into 4 equal portions. 4. Stuff bread into cut side of each artichoke half, gently pressing bread into the cavity and allowing excess to sit on top of artichoke. 5. Place cover on top of the SmartSteamer and microwave 15 minutes or until artichokes are soft, and bottom leaves are easily removed. Slice chicken breasts into strips and place in SmartSteamer base. Slice peppers and onions into strips and place in colander tray. Season pepper mixture and chicken with seasoning. Fill water tray with 1¾ cups water and stack steamer base and colander tray above it. Cover and microwave on high power 15 minutes or until chicken is cooked through. Serve on tortillas with desired condiments. 1. Cut out “V” shape at the bottom of 4 cabbage leaf stalks. Pour hot water over them until limp. Drain and pat dry. 2. Mix bread crumbs, cashews, red pepper, curry, salt, pepper, egg and oil for stuffing. Divide into 4 portions and wrap each with a cabbage leaf, place in the colander tray. 3. Place sliced zucchini in the SmartSteamer base. 4. Fill the Water Tray with 1¾ cups water. Place Steamer Base and Colander Tray over the Water Tray. 5. Cover and microwave on high power for 25 minutes. 1. Cut off tops of tomatoes; scoop out seeds and pulp with a spoon, making a hollowed-out cup. Discard tomato tops and seeds. Chop pulp in the Quick Chef. Drain in Double Colander and set aside for later use. 2. Invert tomatoes on paper towels to drain. 3. Combine water and butter or margarine in a Thatsa Bowl. Add stuffing mix, reserved tomato pulp and stir. Let stand 5 minutes for liquid to absorb. 4. Fill tomatoes evenly with stuffing mix and place in SmartSteamer Steamer Base. 5. Fill Water Tray with 1¾ cup water, place the Steamer Base over the Water Tray and cover. 6. Microwave on high power 10 minutes, or until tomatoes are tender and stuffing is heated through. 1. Place first seven ingredients in the base of your Chop ’N Prep Chef. Replace cover twist to seal and pull cord 4–5 times to blend to a coarse puree. Remove blade and transfer sauce to a small bowl and season with salt and pepper to taste. 2. Place 1¾ cup water in Water Tray of SmartSteamer. 3. Place chicken in base of SmartSteamer; season with salt and pepper and brush with Citrus. 4. Place green beans and red pepper strips in Colander Tray. 5. Microwave on High power 14 minutes or until chicken reaches an internal temperature of 165˚F/74° C. 6. Remove chicken to a serving platter and brush with sauce. Toss the vegetables with 1 Tbsp. Citrus Sauce and serve with chicken. 1. In the base of the Quick shake, add all ingredients for teriyaki sauce, shake to mix. 2. Place chicken breast in season serve container and pour ⅔ sauce over chicken, marinate for at least 30 minutes, refrigerate. 3. Place 1¾ cup water in Water Tray of SmartSteamer. 4. Place chicken in base of SmartSteamer; season with salt and pepper and brush with Citrus. 5. Place all vegetables except green onions in Colander Tray. 6. Microwave on High power 15 minutes or until chicken reaches an internal temperature of 165˚F/74° C. 7. Microwave remaining sauce in MicroPitcher for 1 minute, to warm. 8. Remove chicken to a serving platter, top with vegetables and pour remaining sauce over to coat. 9. Sprinkle green onions over chicken and vegetables. 1. Sprinkle ¼ tsp. salt over chicken breast. Place chicken in base of SmartSteamer. Place 1¾ cups water in the water tray, place steamer base over water tray, cover and microwave on high power 8–10 minutes or until juices run clear and internal temperature reaches 165°F/75°C. 2. Remove chicken from steamer base and set aside. Combine ¼ tsp. salt, olive oil, sugar, chili sauce, grated ginger, sesame oil and lime juice in a small bowl and stir to combine. Set aside. 3. Place the cucumber, radishes, salad greens, basil, mint, red onion and carrots in a large bowl. Toss with half the dressing and divide evenly between 4 plates. 4. Slice chicken breast thinly and divide among the salads. Drizzle remaining dressing over the salad and sprinkle each salad with 1 tsp. crushed peanuts. 1. Place water in the 3-Qt. Casserole Stack Cooker or a 4 cup Vent N Serve, microwave on high for 3-4 minutes, add instant rice and cover, set aside. 2. Place broccoli florets in the base of Smartsteamer. Season fillets with salt and pepper and place fillets in the colander tray. Microwave on high for 8-10 minutes. 3. Place chicken stock, water, yogurt, prepared mustard and cayenne pepper in the Micro Pitcher, cover and microwave on high for 1 minute. Remove and stir mixture. 4. Add coconut and almonds to the rice and fluff with a fork. Place rice, broccoli and tilapia on serving dish and spoon sauce on top. 5. Garnish with a sprinkle of cayenne pepper. 1. Combine salt, onion powder, pepper and garlic powder. Sprinkle mixture over turkey tenderloin on all sides and place in Steamer Base. 2. Place cubed sweet potatoes in the Colander Tray. Fill Water Tray with 1¾ cups water. Place Steamer Base on top of Water Tray and Colander Tray over Steamer Base. Cover and microwave on high power for 14 minutes or until turkey juices run clear and turkey reaches an internal temperature of 165°F/75°C and sweet potatoes are tender. 3. While turkey cooks, place the green onions and cilantro in base of Chop ’N Prep Chef. Pull cord 4–5 times to process until finely chopped. Remove cover and add olive oil, maple syrup and seasoning blend. Replace cover and pull cord 4–5 times to fully combine. 4. In a medium bowl, combine sweet potatoes and contents of Chop ’N Prep Chef until coated. Slice turkey and serve alongside sweet potatoes. 1. Place first six ingredients in the base of your Chop ’N Prep Chef. Replace cover twist to seal and pull cord 4–5 times to blend to a smooth. Remove blade and transfer sauce to a small bowl and season with salt and pepper to taste. 2. Place 1¾ cup water in Water Tray of SmartSteamer. 3. Place whole potatoes in base of SmartSteamer. Cover and place in microwave and cook on High power for 16–18 minutes or until potatoes are tender when pierced with a fork. 4. Remove potatoes from SmartSteamer and when cool enough to handle cut into large chunks or slices and place in serving bowl. 5. Immediately pour dressing over potatoes and toss gently until combined; season with salt and pepper to taste.